This is the third online issue of the department’s biannual newsletter, put out to coincide with pre-registration period. We hope you will find it accessible and useful, and welcome comments and suggestions. Students are reminded that early pre-registration for spring semester courses not only saves you money but also ensures that the courses will run and that there will be a place for you. The department strongly recommends consulting with your departmental advisor before or during the pre-registration period. This is critically important for graduating seniors, who must file their paperwork for (May) graduation by early February. It is department policy that both Sociology and Criminal Justice majors should take Methods and Techniques of Social Research (920:301) as early as possible in their academic career, and that transfer students should take the course in their first semester at Camden. If you are a major and have not taken this course, you should definitely take it in the spring. It is a prerequisite for other upper-level courses, and the knowledge of MicroCase gained in the course is required in both Sociological Theory and Theories of Crime and Delinquency, as well as other courses. 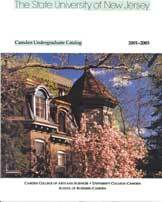 The Spring 2002 schedule includes several courses not regularly offered. Visiting Prof. Sheryl Van Horne will introduce courses in Victimology and Drug Policy, and will offer again her Criminal Justice Planning course. Dr. Kathleen Asbury will be teaching Sexuality and Society, and Dr. Alexander Christensen will offer Physical Anthropology. Monika Wood will again offer her Sociology of Work and Careers course, which combines analysis of the changing nature of work with collaboration with the Career Center to help students plan their careers and develop important job-related skills. This is a particularly valuable course for graduating seniors. Dr. Augustine Isamah returns to teach Peoples and Cultures of Africa and Sociology of the Family, and Patrick McCarty will again offer Psychological Anthropology. John Weathers will continue to teach two sections of Sociology of Education, a required course in the Teacher Preparation Program. An unusually-full summer schedule is planned for 2002. The tentative schedule may be accessed by clicking here. Teaching Excellence Center Director Dr. Nancy Omaha Boy will offer a Spring course in North American Indians and then a Study Tour on the Art and Culture of Northwest Indians in May. Students taking both the course and the study tour may write a combined paper for both. These pictures were taken byDr. Omaha Boy on the tour in 2000. Contact her directly for further information. The Department’s Service Learning course, offered jointly with the Psychology Department, will enter its third semester in the spring. The course, led by Anne Harkins, Technology Coordinator at the Molina School, focuses on “Bridging the Digital Divide in Camden” and meets each Wednesday afternoon as a seminar, with each student performing approximately five hours of service work at schools or community centers in the city. Service Learning offers a chance to contribute to the Camden community while at the same time acquiring valuable knowledge and skills. Starting in September 2002, the Department of Sociology, Anthropology and Criminal Justice will include for the first time a graduate program: a M.A. program in Criminal Justice. The program is being instituted in close cooperation with the Department of Public Policy and Administration, and will have a strong administrative skills focus. During the current academic year, the Department expects to hire two additional criminal justice faculty members to help get the program underway. For further details, see Dr. Humphries, who will be the graduate program director. In related news, student Steven M. Carter received this year a John Norcross Memorial Scholarship to pursue his undergraduate major in Criminal Justice. Is There Something About South Jersey? With assistance from recent sociology graduate Jason Leonardis, Professor Ted Goertzel has created an online presentation called “There’s Something About South Jersey.” The presentation presents findings from a survey of South Jersey residents as well as a broader discussion of visions and options. It includes data on what people like and don’t like about South Jersey, and presents a set of “controversial theses” intended to stimulate thought and discussion. The presentation may be accessed at https://crab.rutgers.edu/~goertzel/sj.htm. Check it out! Sponsored by Center for Children and Childhood Studies, whose director is Anthropology Professor Myra Bluebond-Langner, the Campaign for Children’s Literacy held a highly-successful kick-off event on Saturday, September 15th. Former Rutgers-Camden Sociology major and MSW Angela Connor played a major role in organizing the event. In addition to performances by Queen Nur and Sister Mafalda and the Kuumba Performers, over 1800 books were given to children from over 400 Camden families. Click here to see a short streaming video of the festivities. The Center has received major grants from the John S. and James L. Knight Foundation and the Annie E. Casey Foundation to support the literacy initiative. Among the Center’s various activities, a Childhood Studies minor was instituted in the fall semester. The Center offers various internship possibilities for interested students. With Afghanistan so much on everyone’s mind but so little understood, Sociology Chair and Professor Robert Wood has dusted off some old slides he took when he spent several weeks there when he was a graduate student at the University of California, Berkeley. The result is Afghanistan in 1973: Memories and Pictures in Retrospect, a website providing a brief historical context and pictures of the country at the time. Dr. Wood emphasizes the importance of understanding that themujaheddin rebellion emerged originally in response to efforts by a series of left-wing governments in the later 1970s to bring land reform and expanded rights to women in the countryside. Unfortunately the heavy-handed approach of these regimes provoked widespread uprisings, and it was in these circumstances that the beleagured government made the fateful and disastrous decision to invite in Soviet troops. U.S. support of the mujaheddin in this Cold War context paved the way for the ultimate victory of the Taliban and the continuing tragedy that has engulfed the country. Students are strongly encouraged to familiarize themselves with the policies and resources at this site. Are you engaged in research this semester as part of a course or an independent study? Plan to present it at the annual Undergraduate Research Poster Session, co-sponsored with the Psychology Department in April 2002. It looks good on your resume and it’s great fun as well. So save your work and think about how to present it visually. Further details will be forthcoming, but interested students may check with Prof. Wood in the meantime. Last year’s Poster Session attracted over 100 presenters and guests. Photos taken by Prof. Goertzel at the event last year may be seen at https://crab.rutgers.edu/~goertzel/postersession2001.htm. Note: Students wishing to do independent research for credit during the spring semester should be formulating their projects and lining up faculty advisors now. For research involving human subjects, IRB (Institutional Review Board) approval must be sought ahead of time. Drs. Wood and Meyer are looking for student assistants to provide MicroCase tutoring to students in various courses, grading of exercises, updating of the MicroCase Resources webpage and assistance in developing online MicroCase tutorials as part of the department’s web-enhanced curriculum. Interested students (who must have completed Dr. Goertzel’s Methods and Techniques of Social Research course) should contact Dr. Wood or Dr. Meyer. Dr. Goertzel is also looking for an assistant for his Methods and Techniques of Social Research class. Up to three credits of independent study may be earned; there is also the possibility of work-study or other payment in lieu of credit. This page was printed from http://sociology.camden.rutgers.edu/news/newsletter/fall-2001-newsletter/ at 10:40 PM Thursday, April 25, 2019.